One of the most prominent AMCs in India has recently launched a new fund offer wherein the investors can take advantage of the sectors benefiting from the consumption of goods such as consumer non-durables, auto, consumer durables, healthcare services, etc. Such investments can be made with a bottom-up selection view for around 3-4 years. They have the ability to reduce the net equity risk when the markets are at their peaks. The exceptional scheme of ICICI Prudential MF aims to limit the downside of the portfolio by using hedging strategies. The tagline of the scheme says, “A trillion dollar opportunity,” which will be open for investors from July 30, 2018, to August 13, 2018. Let’s find out why is it referred to as a brilliant opportunity for the investors to invest in. How Can ICICI Prudential Bharat Consumption Fund- Series 4 Help You Be a Part of India’s Growth Story? India- the country which took almost 60 years to enter trillion dollars club took just seven years approximate to double its economic growth. Another remarkable growth was seen in the Indian equity market capitalization which was 1 trillion in 2007 and turned to 2 trillion in 2017. India is considered to be one of the fastest growing economies in the world. It is gaining prominence in the world’s GDP ranking 6 in 2017. With the expanded economies, there are several companies which increased in size by leaps and bounds including FMCG, car manufacturers, apparels manufacturers, and pharmaceutical companies. However, there were a few of the factors which hampered this growth including monsoon deficiency in FY 14-15, low wage growth, minimal MSP hikes, and events such as demonetization and GST implication. With these many businesses faced a downturn. But soon, things started getting normalized as seen in the Q3 and Q4 of FY 2018. Thus, it is firmly believed that the growth would recover to its long-term average by the next fiscal year. This is your time to invest in and gain the advantage of the opportunities lying in the segment. 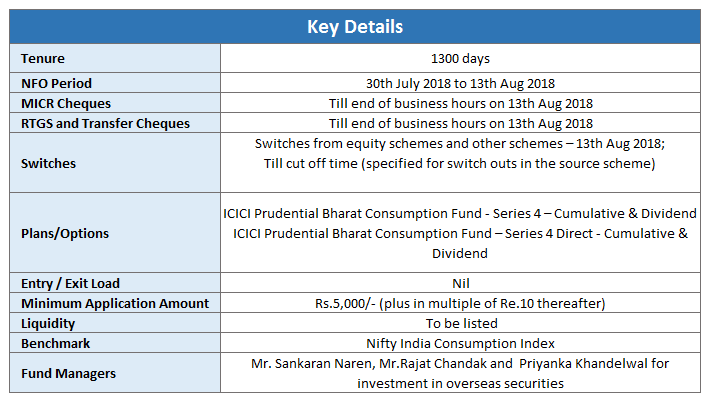 ICICI Prudential Bharat Consumption Fund – Series 4 is a close-ended equity scheme which is following the consumption theme for investment. It is suitable for investors who have long-term wealth creation goal in mind. The scheme tends to offer capital appreciation by predominately investing in a well-diversified portfolio of stocks that could benefit from growth in consumption and related activities. What Can Be Expected from Different Consumption Sectors in the future? As per the data, the potential beneficiaries of the consumption sector include Auto, Consumer Non-Durable, Retail, and Aviation & Hotels and Resorts industry. Here are a few statistics that will prove why the fund can be a great bet for investors. Indian auto industry accounts for 7.1% of the country’s GDP, and it is one of the largest globally. The two-wheeler industry grew at around 15% during FY 2018, leading to exports surge by 20%. The consumer non-durables sector is expected to revive in FY 2019 because of hike in MSP, the expectation of normal monsoon, premiumization of products. There are several similar records which depict that the growth is bound to happen anytime soon and the investors should take benefit from the same. If you too find this NFO an excellent opportunity to invest in, then you can do so under the guidance of experts at MySIPonline. To start the process. simply click on ICICI Prudential Bharat Consumption Fund . For more details on the same, connect with the experts associated with us as we are ever ready to serve you with all our might.